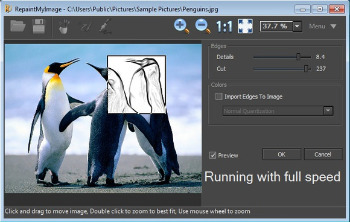 RepaintMyImage is a simple tool with a straightforward functionality that allows you to retouch your digital images and convert them into paintings or cartoon-like illustrations in seconds. It offers you three “repainting modes” – smudge, repaint, and cartoonize – each with its own simple settings and quick, impressive results. In order to speed up the retouching process and to provide you with a real-time preview of all the changes applied, RepaintMyImage will work only on an area of the image. This area is clearly marked with a white square, and you can move it around the image with your mouse to check how the settings used look on a specific area of the photograph. Once you are happy with what you see, you can tell the program to apply the selected effect to the entire image, according to your customized settings. This editing process is identical in all three retouching modes, a consistency that helps to make this tool suitable for all types of users. Quite logically, the settings vary from mode to mode, but most of them use convenient sliders that make it very easy for any user to try different values, even when they do not know what they are doing. This is so because the program’s simplicity of use does not seem to match with some of the names used to designate some of the settings – we all know what smoothness is, but not everyone is familiar with “sigma” or “quantization” levels. Other than that, RepaintMyImage is certainly a tool for everyone, and the repainted images it produces really look good.